Whether you can map the zodiac sky with your eyes closed or simply love a good horoscope reading when you’re bored, you have to admit—astrological signs, and all that they represent, are pretty fun to explore. 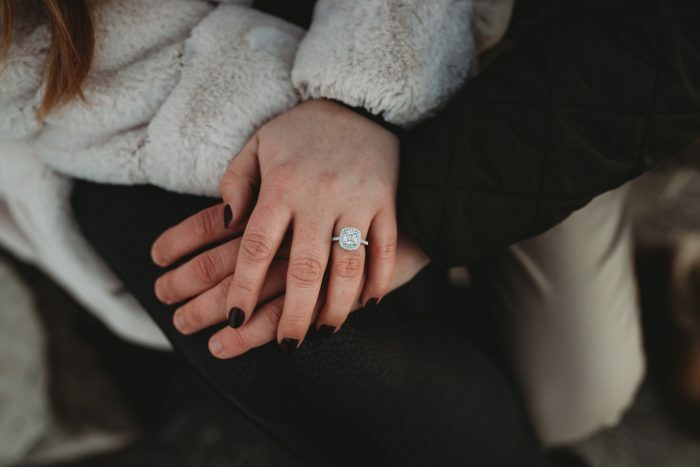 Today, then, we’ve hand-picked our top engagement rings based on each sign’s prominent personality traits—from the nurturing Cancer to the intense Scorpio. Read on for our top zodiac-inspired picks! The Aries sign is known to be a pioneer and a trailblazer—so, if this is your partner, we love the idea of opting for something a little trendy. Our favorite option? 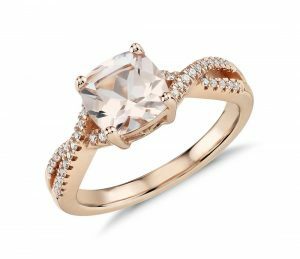 This Morganite and diamond Infinity Twist Ring for a serious statement that’s sure to speak to her trailblazing Aries heart. The Taurus sign is all about being trustworthy, persistent, and a provider—so a classic design is a great option for the timeless Taurus in your life. 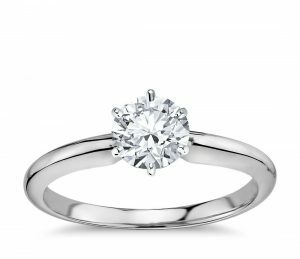 We’re all about this six-prong solitaire ring from Blue Nile for a clean design that’s (almost) as tried-and-true as she is. If your partner is a Gemini, chances are she’s versatile and vibrant (to say the least). 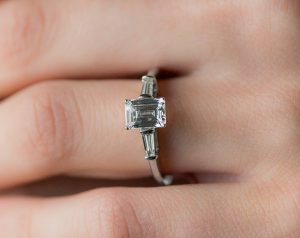 We love the idea of something that, like her personality, is both modern and classic—like this stunning emerald split-shank engagement ring. We’re obsessed with the way the unexpected horizontal setting adds just the right amount of rebellion to the overall timeless look-and-feel of this stunner. The Cancer in your life is likely a nurturer (lucky you), which is why we think she deserves something stunning and storied, and with a serious vintage vibe. Boasting an aesthetic that feels both artful and endlessly eye-catching, we’re swooning over this milgrain marquise and dot diamond engagement ring. The Leo in your life may be a bit of a drama queen—and we happen to love that. 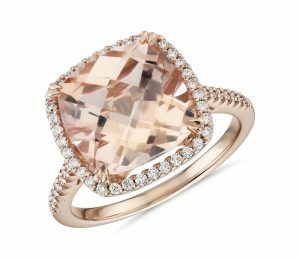 Opt for a ring as bold as her personality—like this stunning cushion-cut morganite ring from Blue Nile. 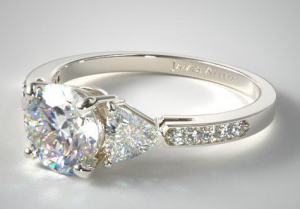 With a seriously head-turning center stone made even more noticeable by the dreamy halo framing it, this one is as unapologetic as your Leo love herself. 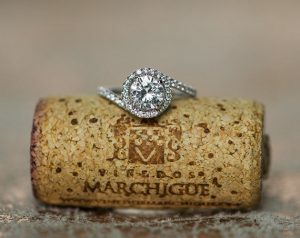 Virgos are known to be caring teachers, which is why we think this sign deserves something with a story behind it—and this three-stone white gold engagement ring from James Allen fits the bill perfectly. The Libra in your life is likely all about peace, love, and harmony (ohhhhhm), making her ring finger perfect for a piece that represents unity. We love the idea of opting for this unexpected white gold abbraccio swirl engagement ring. Paying serious homage to the classic yin-yang symbol, this one is sure to speak to any peace-loving Libra’s soft heart. If you’ve got a Scorpio in your life, chances are she brings some serious intensity to the table—which is why she deserves an engagement ring with lines as sharp as her focus. Our favorite option to win her over? This white gold three-stone emerald engagement ring that boasts a design aesthetic that’s as hard-lined and laser-focused as she is. 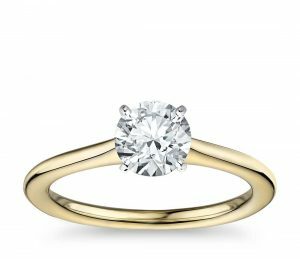 The Sagittarius sign is known to be a worldly adventurer, which is why we think she deserves an engagement ring that’s as unexpected as her last-minute weekend plans to jet-set somewhere stunning. 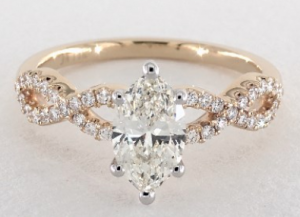 This marquis-cut pave engagement ring in yellow gold ought to do the trick. Of all the things a Capricorn is, spontaneous likely isn’t one of them. Known as the master planner of all the zodiac signs, we think the Capricorn in your life needs something practical, but still stunning. Our favorite down-to-earth option? 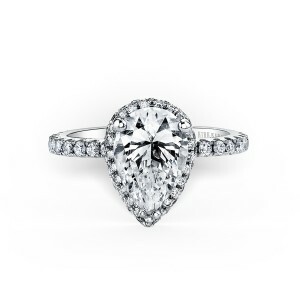 This timeless petite solitaire engagement ring from Blue Nile. The Aquarius sign is known to be innovative with a huge heart (swoon), which is why a conflict-free diamond will likely speak her love language loud and clear. 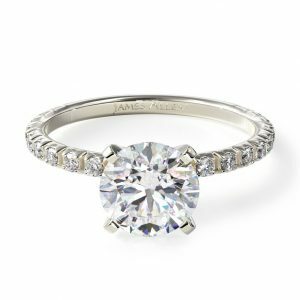 We’re obsessed with this white gold split-shank conflict-free engagement ring from James Allen for the big-hearted Aquarius in your life. 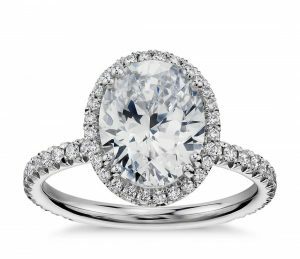 PRO TIP: Both James Allen and Blue Nile only sell conflict-free diamonds, so you can’t go wrong with either of those trusted brands. 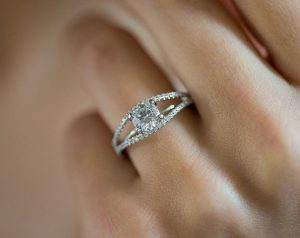 The sign is known for its sensitive soul, making a romantic engagement ring the perfect option for your Pisces partner. 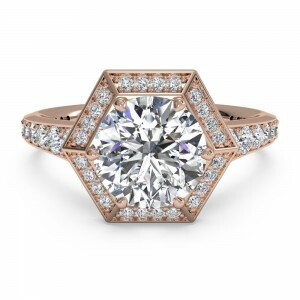 We’re head-over-heels for this oval cut halo diamond engagement ring from Blue Nile. With an aesthetic that feels both royal and romantic, it’s a stunning option for the sweet-souled Pisces in your life. 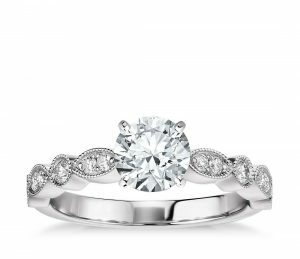 Still not sure which ring is right for your partner’s personality? 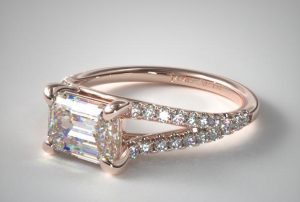 Learn how to design a custom engagement ring online!